Not too long ago, on the way home from Nuremberg, I stopped at one of the region’s bigger Getraenkemarkts (specialized drinks shop). As I hadn’t been to this particular store in a while, I wandered around optimistically, hoping to be surprised, and surprised I was. In the poorly-stocked, labeled, and catered “craft section” I spied several cases of the Weihenstephan/Sierra-Nevada collaborative beer, Braupakt. This beer was brewed in January 2018 and released worldwide in March, according to Weihenstephan’s website. I’d learned about it from a connection at American importer Total Beverage Solution in May, checked out the promo video on the Bavarian’s website, and planned a stopover at the brewery to sample and likely pick up a few cases when next en route to Munich. Sadly, this didn’t happen. 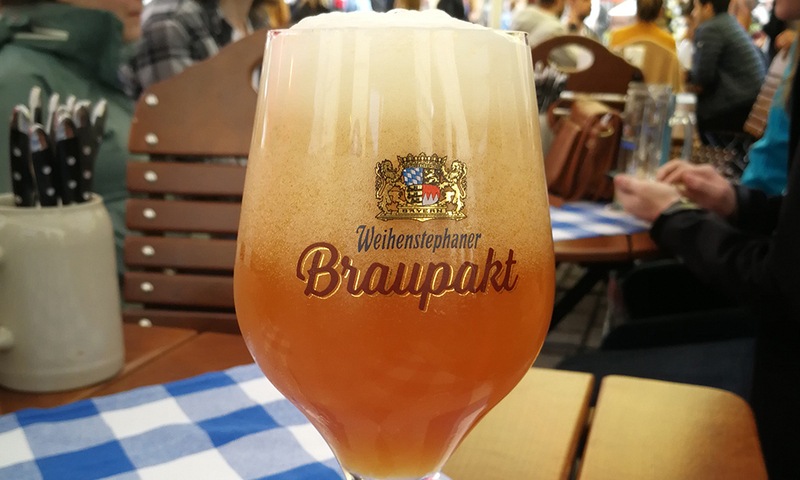 When I stopped at Weihenstephan’s celebrated brewpub in Freising mid-May, the first thing I noticed after walking through the door was a framed placard advertising their 1516 Kellerbier, brewed two years ago to celebrate the Reinheitsgebot’s quincentenary. 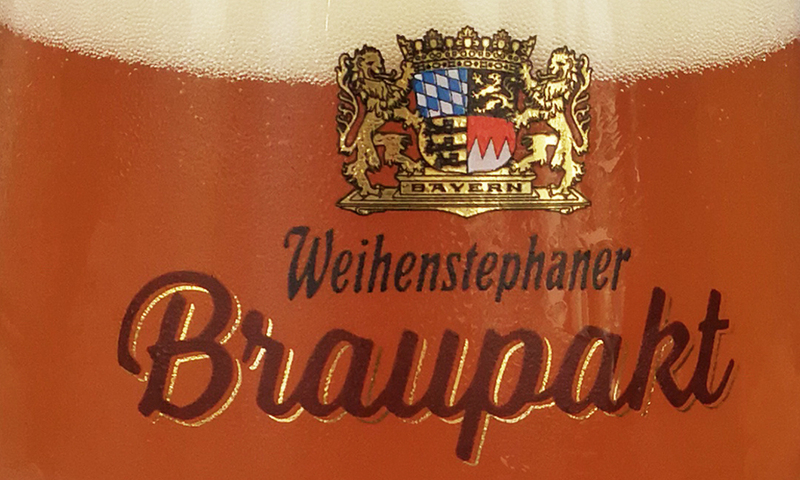 Surprised, but not yet daunted, I asked a waiter about Braupakt, but he was unfamiliar with it. I then asked a waitress, but she hadn’t a clue. I next inquired via a barman of sorts, and he said he’d have to get a manager. Five minutes later, I was bluntly informed that they were no longer carrying it, had in fact stopped a month ago. It wasn’t on tap, wasn’t available in the bottle-wasn’t there at all. Sorry. I asked why they were pouring a beer from two years ago when this collaboration was the biggest thing to happen to Weihenstephan since, well, maybe ever. No idea. Nobody knew Sierra-Nevada. Nobody seemed to know beer. And nobody really cared. This behavior is sadly standard for most breweries in Germany, where both product knowledge and standards of service are abysmally low, but I expected a bit more at the home pitch of die aelteste Brauerei der Welt. Unfortunately, like the special release I’d gone looking for, it simply wasn’t there. The one place I could buy Braupakt, the brewery store, had closed for the day, so I left Freising for an overnight in Munich, sure I could score a summer supply somewhere before heading north again. That also didn’t happen, and not for lack of trying. I didn’t find Braupakt in Freising, in Munich, or anywhere in between, not at gas stations, drinks shops, or an assortment of supermarkets. I didn’t find it on the way back to Franconia, celebrated land of beer, either. And of course I certainly didn’t find it in Franconia, as the locals aren’t too keen on Bavarian imports. I began to think it was simply brewed for export, and so called up a few colleagues back in the Bay Area to get some feedback on this elusive trans-atlantic Hefeweizen. I was told Braupakt was a damn fine beer, and quite the hit. It was everywhere in SF, and doing well throughout the Bay. Given Weihenstephan’s unique success in Northern California and Sierra-Nevada’s address, this didn’t surprise me much. My colleagues, however, were at quite the loss when I told them I was yet to try one, would have to rely on their tasting notes. “How is that possible?” they asked. “You’re in Bavaria!” Well-noted. How indeed? But I knew there was one place I’d be sure to find the White Whale-Berlin. On a stroll around Hackescher Markt in Mitte, after a cursory stop at Lemke, I stumbled upon the Weihenstephan tavern, bedecked with flags and signage advertising this rightly-celebrated release. I stopped, sampled, and enjoyed. Truth be told, Braupakt really wasn’t pushing too much envelope, despite it being a big deal in the Hefeweizen world. It was a solid beer, and a welcome, albeit slight, change from the norm. But as it drank mostly as a profound anticlimax, I didn’t trouble myself with sourcing a few Kisten before returning home. I bought Lemke and Firestone Walker instead. I’d forgotten about Braupakt until that stop in Nuremberg, but seeing those two forlorn cases, discounted and likely well-travelled within the retail chain, reminded me of how this beer almost single-handedly epitomizes the state of beer and brewing in Germany. And it’s a state that remains dire. In any other place in the world a collaboration with Sierra-Nevada would be huge news for the partner brewery, the fans of that brewery, and any local who cares about beer. In any other place in the world, that partner would leverage such a hallowed opportunity to the hilt. In any other place in the world, that partner would be celebrating, marketing, and pushing the collaborative beer any way it could. In any other place in the world, that beer would be a defining element of the brewery until it was gone, and one you’d see everywhere within its current footprint. In any other place in the world, the hometown market would be ground-zero for market saturation. In any other place in the world, well, you’d certainly be able to order that beer if you’re at the brewery where it was made. But this is not any other place in the world. This is Bavaria, Germany, supposed beer paradise. And it is a paradise, if your idea of heaven is a Greatest Hits album forever on repeat. If not, if you eschew the record labels’ cynically-chosen Best Of lists for your own deliberations and more of an organic, evolving approach to music, than Bavaria is not so much a paradise as it is a hell. Bavarians, and to a large part, Germans, are the preeminent Greatest Hits demographic. Here, Hits have been chosen, are entrenched, and have come to define what most people consider music. The Hits are here to stay-everything else is just pop, casually enjoyed, but not taken at all seriously. The Hits are tradition, the rest might as well be heresy. In this regard, Weihenstephan is best thought of as Bavaria’s oldest record label and radio station. They’re State-owned, staunchly conservative, and the very definition of traditional. They’ve defined the Hits for so long they’ve forgotten how to listen or hear anything new, and if they ever bothered likely wouldn’t consider it music anyway. This is how something like Braupakt might as well never have existed here in Bavaria, created as it was for the more open-minded export markets of Berlin, Hamburg, and the States. Anywhere else in the world Braupakt would have been a hit single or song of the summer. Here in Germany, it’s almost more of an import, or something like pirate radio, despite being proudly(?) homegrown . If you’ve the mind and the wherewithal, you know it’s there, and the likely places to find it. For everyone else, it’s just more Shut Up and Play the Hits.